Susan Wilson, Critique Group Chair, discusses why joining a critique group provides each CWC member benefits that improve their writing. She discussed critique group guidelines and some best practices for participating in a group. 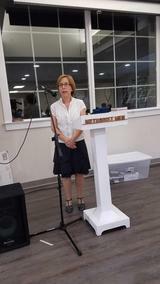 Susan Wilson, Critique Group Chair, kicked off our critique group discussion by reading a letter addresed to Any Writer, Anytown, USA. I am a writer—not a famous one like Stephen King or Mark Twain. Just a writer. Nowadays, there are about a zillion of us around—many of us self-published. Am I am getting rich? Well, no, but I’m having fun. Someone famous once said, “Writing is the only profession where no one considers you ridiculous if you earn no money.” (Jules Renard). Not only is it not paying my bills, it’s a lonely business. When I’m at my computer or staring out the window (yes, that counts as writing), no one is around. But don’t get the wrong idea. I’m not all alone. Once a month I meet with other writers in a critique group. We read over each other’s work and give advice. I usually don’t like getting advice. I once told my sister the difference between her advice and pizza is—I asked for pizza. But this time, I want advice—from other writers like me. They always make my work more polished. My characters come more clearly into focus. My plot becomes more interesting. Sometimes my critique partners “gently” tell me what isn’t working in my story. So, you see, we help each other. Not only with advice but with encouragement. It is also an excellent way to network with other writers. We share marketing ideas and publishing news. I’m telling you this, America, because I am so happy I found this group. It is probably the best thing I have ever done for my writing career. If you’re a writer, you should try it out. Take a chance. Go for it. 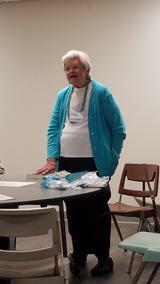 Elizabeth Miller, Novel Critique Group lead, discusses how being a critique group has benefited her. She explained how her writing became much better because her group's feedback have been 'so useful'. She went on to explain that being in a critique group and working with each member 'inspires me'. 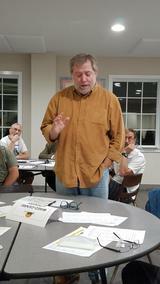 Howard White, Historical Fiction Critique Group lead, started this group last year. He discussed how the group supports one another and are able to send pieces of their work to one another through email to review prior to the group's meeting. 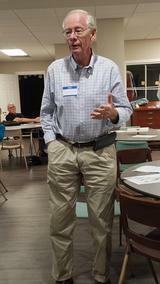 Paul Oakes, Critique Group Leader for two mixed genre groups shared his insights about critique groups. "Keeps our projects going." "The critique group is really helpful to give each writer new insights." He went on to share that not only do critique groups share what needs improving, 50% of it is what they like about your writing, which is the encouragement you don't get writing alone. Hover over short video to select play button and to make it a full page.